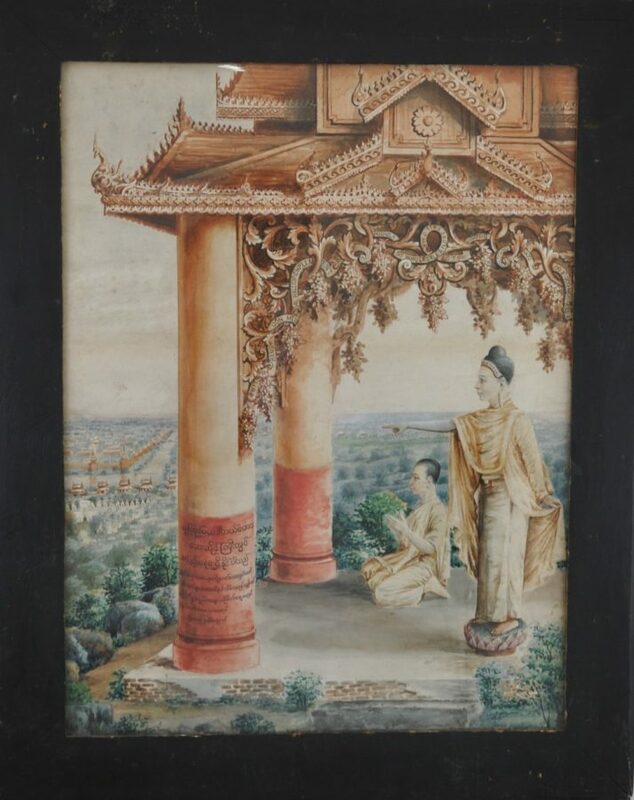 This unusual, large watercolour undoubtedly by a local Burmese artist was presented as a marketing gift by the Rangoon Medical Hall, and so worked into the design is the inscription, in English: ‘With Rangoon Medical Hall Co’s Cmpliments (sic). Highclass Wholesale and Retail Chemists’. This is followed by an inscription in Burmese. 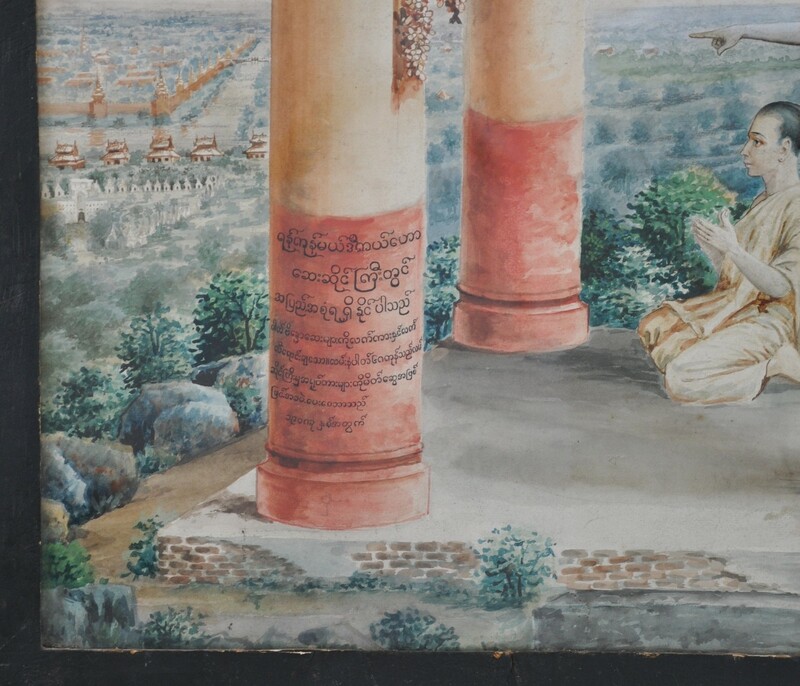 There is also a much longer inscription in Burmese on the lower column in the foreground of the picture. The image shows what is believed to be the Pointing Buddha of Mandalay standing under a heavily ornate veranda on a hill (probaby Mandalay Hill) pointing and looking over a moated settlement (the royal palace in Mandalay). The Buddha stands on a lotus petal dais and is accompanied by a seated attendant, Ananda. 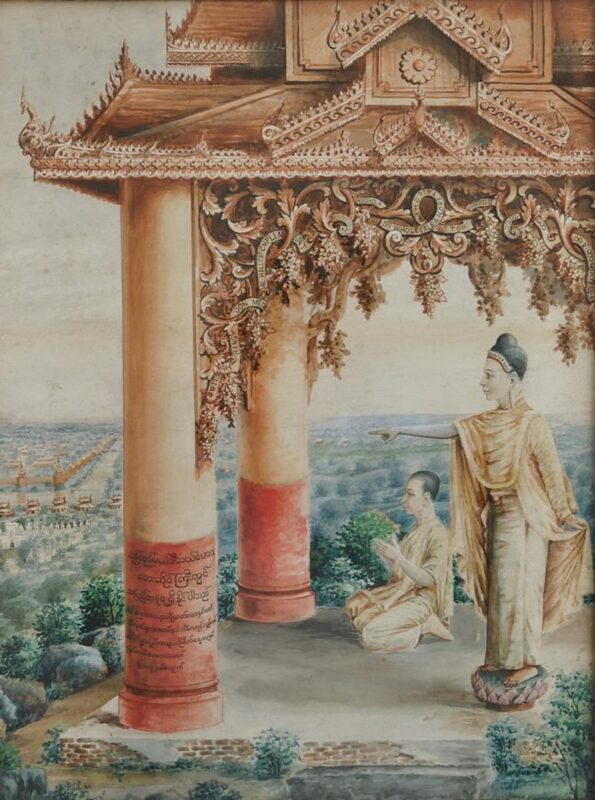 This particular Buddha image (and attendant) was destroyed by fire in 1892 and later rebuilt around 1907, after which it was enclosed by a brick wall. It is possible that this is the only known image of this statue prior to it being destroyed and whilst still in its original setting (Don Stadtner, pers. comm.). The Rangoon Medical Hall Company is listed as having operated from premises at 72 Merchant Street, Rangoon, at least as early as the 1890s. The last image from the studio of Watts and Skeen shows Merchant Street in the 1890s and the Rangoon Medial Hall in the building on the left. 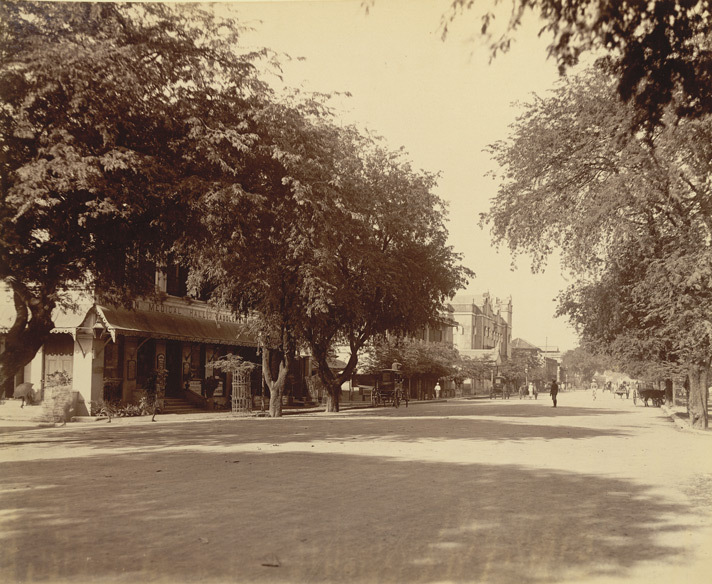 Merchant Street was the main commercial or business street in Rangoon during British colonial times. 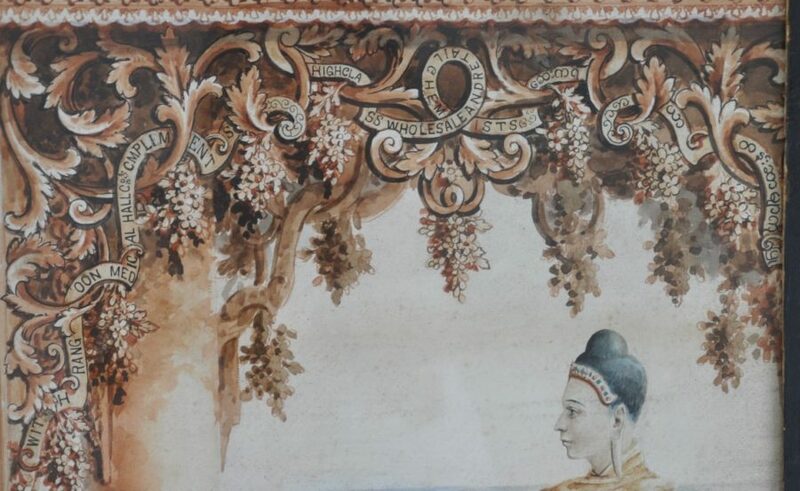 The watercolour does not appear to be signed by the artist. It is in fine condition with little evidence of damage or fading. It is currently framed, under glass. 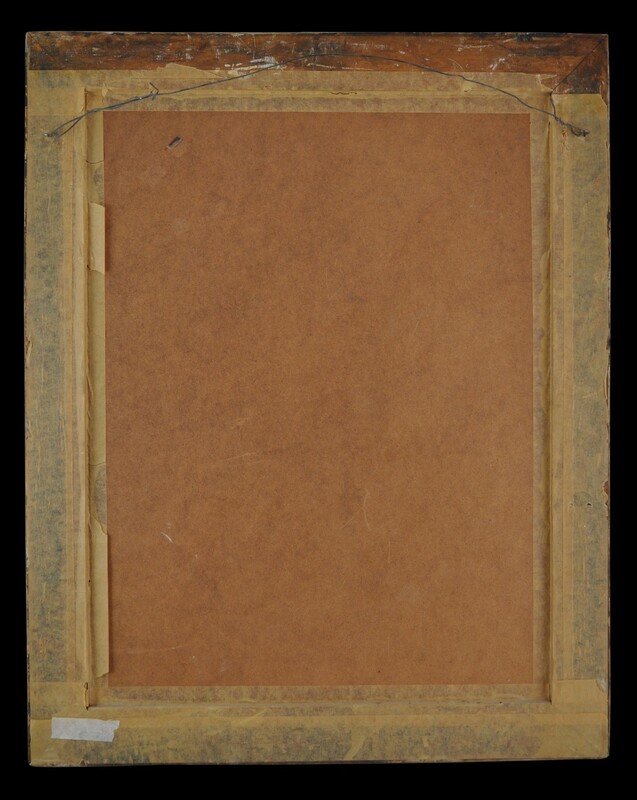 The frame is old but not likely to be the original. Stadtner, D., Sacred Sites of Burma: Myth and Folklore in an Evolving Spiritual Realm, River Books, 2011. Stadtner, D., pers. comm, April 2019.